One of the most romantic ways to celebrate Valentine’s Day is to dine with your special someone. 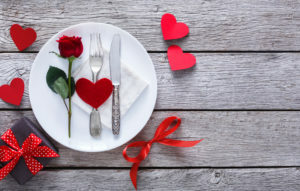 We’ve asked co-workers, friends, and family for their recommendations of where is the best place to take your Valentine in the area. Although unscientific, we’ve compiled this list of 14 of the area’s most love-inspiring dining spots, one for each day of February leading up to the big day. As Valentine’s Day is one of the most popular days to dine out, don’t forget to make your reservation early! It doesn’t get more romantic than dining atop Mt. Washington. If the view from Altius doesn’t set your hearts soaring, then its seasonally inspired, locally sourced menu will. You’ll feel as wealthy as Andrew Carnegie when you dine at Andrew’s Steak and Seafood inside the Rivers Casino. In addition to beautiful views of the city, Mt. Washington, and the river, Andrew’s offers fresh seafood and delectable steaks fit for a tycoon. If you enjoy dining in style with white linen tablecloths, attentive wait staff and fine cuisine, then The Carlton will fulfill your Valentine desires. The menu and wine list are extensive and are a few of the reasons diners have been frequenting The Carlton for more than 30 years. Looking to thrill your Valentine with exceptional Mediterranean cuisine? Then grab your date and ask them to come with “ze to the Casbah.” The year-round heated garden gives an al fresco feel even in February, and the inside dining room is hip and exotic, making for a memorable dining experience that your Valentine won’t soon forget. It’s all about love on Valentine’s Day, and at the Gran Canal, husband and wife Michele and Antoinette Bonaventura, owners of this restaurant, share a love of food and of introducing their fine cuisine to customers. All dishes are made fresh daily and are cooked to order. Inside the Grand Concourse with its marble pillars, stained-glass ceiling, and grand staircase, one would almost expect The Great Gatsby to squire Daisy Buchanan here. The beauty of the interior of the preserved Pittsburgh and Lake Erie Railroad Station is only eclipsed by the scrumptious seafood, steaks, and poultry. Situated on the Monongahela River, it has a spectacular view of Pittsburgh’s skyline. Located in the Scott Towne Center off Greentree Road, Il Burloni is a small gem of an Italian restaurant. The family-owned restaurant provides delicious cuisine in its cozy dining. The establishment is BYOB so be sure to bring your own libations if you want to wine, as well as dine, your Valentine. What can be more romantic than sharing food with your valentine? At Melting Pot, you can indulge in a variety of fondues including several types of chocolate fondues such as Flaming Turtle and Banana Foster. If you like a restaurant’s ambience to exude charm, then Palazzo 1837 Ristorante is a match made in heaven. Dine in the beautifully decorated rooms of this old mansion, complete with white linen table cloths, fireplaces, and bouquets of flowers. Salad are finished with dressings made from scratch and the restaurant also features hand-crafted, pre-Prohibition specialty cocktails. Cozy, charming, and French: what more could you desire from a dining experience on Valentine’s Day? At Paris 66 Bistro, from the atmosphere to the cuisine, you’ll feel like you’re dining in Paris, the most romantic city in the world. If you want to treat your love like royalty, then Shakespeare’s, which is designed as a 16th Century castle, is just the place. It has an extensive menu featuring everything from sandwiches to steaks to enthrall the king or queen of your heart. Your valentine will have no choice but to say Ooh l al la! after a dinner at The Twisted Frenchman, where guests are invited to experience a 3-, 8-, 14-, or 21-course feast featuring the most inventive and delicious French cuisine in the region. There is a Vallozzi’s on 5th Avenue in downtown Pittsburgh, but it is the Greensburg location where it all began. For more than 50 years, Valentine couples have been sharing special dinners at Vallozzi’s in Greensburg, where the gnocchi and pasta are homemade. Willow’s smart, contemporary ambiance with picture windows will lure you in, but it is the restaurant’s outstanding menu that will most impress you. From small plates, burgers, and flat breads to entrees such as shrimp and grits and duck breast, Willow will wow your valentine.